The Dungeons & Dragons team has rounded up a new group of rogues, hard-drinking fighters, and wizards—as well as Chris Hardwick—to set off into the Forgotten Realms on a new adventure. Nerdist and Geek And Sundry are co-producing Force Grey: Giant Hunters, a new webseries that enlists several celebrity players in a quest that involves tracking down the giants of old. The A.V. Club has the exclusive trailer for the eight-episode series, which debuts Monday, July 11 on Nerdist. 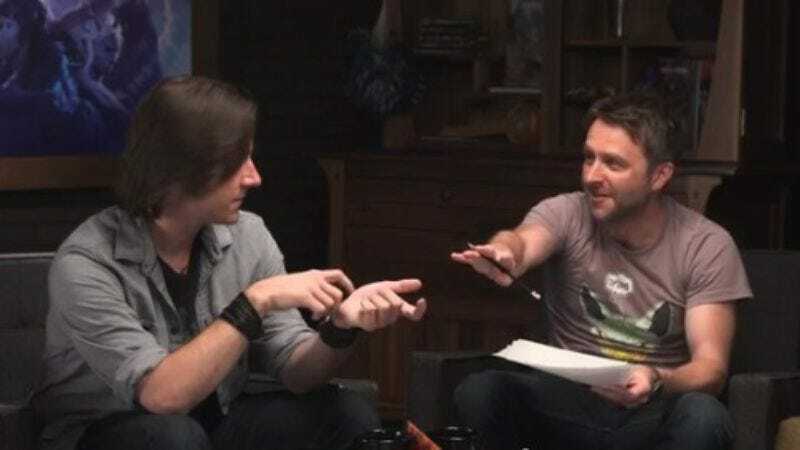 Matthew Mercer, veteran voice actor and leader of Geek And Sundry’s Critical Role webseries, is handling the Dungeon Master duties, and the raucous party of adventurers is chock full of comedians. Hardwick’s playing a “bookish elf wizard” named Whil Wee-Tawn (the inspiration’s obvious), while Jonah Ray is angling for victory as Joppa, a wise monk and fisherman. Brian Posehn’s lending his D&D skills and own melodious voice to Calliope, a female half-elf bard. Blindspot’s Ashley Johnson, who also appears in Critical Role, is the half-orc cleric/inventor Dagny Halvor, while The A.V. Club’s own Shelby Fero is playing the appropriately named Brawlwin Chainminer, a “dwarf fighter with a floating shield and a crippling fear of heights.” And D&D newbie Utkarsh Ambudkar (The Mindy Project, Pitch Perfect) is cracking wise as the scoundrel Hitch. Force Grey: Giant Hunters will roll out new episodes every Monday throughout the summer, when viewers will also get info on the upcoming D&D adventure Storm King’s Thunder.